Written by WILDmonkeyDESIGN on June 11, 2018 . Posted in Branding, Design, Identity Design, Logo Design, ROI. Art is subjective; it’s like a game where there are almost no rules. The design is different, and the fact that someone can put together a list of principles should already tell you that there are some rules to the design game. If there are rules, then we can determine if these rules are being implemented, which means that design is not subjective. To be fair, we can’t say that design is 100% objective; there are always things that come down to personal preference that is determined by your culture and experiences. Now, this “tiny” level of subjectivity doesn’t mean that you can’t tell good design from bad, it means that you might find a good design “ugly,” or you might find something beautiful when it might be a poorly designed. 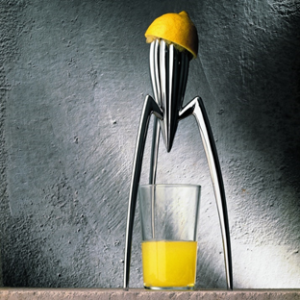 Let’s look at one example, the lemon squeezer. I think almost all can agree that this is a beautiful piece of design but the million-dollar question is, does that make it a good design? Why? Because it has so many functional problems that we won’t even bother to write them here. Go to Amazon and read the reviews if you are interested and want to have a laugh, or read this. This is not useful in doing the one thing that it’s designed to do, help you to get that fresh juice. It’s possible for something to be “good looking” but still be a bad design. You need to look beyond the aesthetics and stick to a list of 5 “design checkpoints” that help you filter the good from the bad. There is a lot of nuances involved, so I’ll try to expand each of these checkpoints. Stay Tuned! Based on the lemon squeezer, we think you can already guess the first one.